From Please (New Issues Press 2008). Used by permission. Jericho Brown worked as the speechwriter for the Mayor of New Orleans before receiving his PhD in Creative Writing and Literature from the University of Houston. 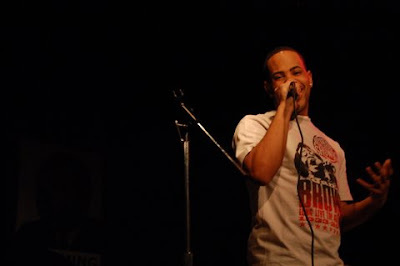 He also holds an MFA from the University of New Orleans and a BA from Dillard University. The recipient of the Whiting Writers Award, the Bunting Fellowship from the Radcliffe Institute at Harvard University, and two travel fellowships to the Krakow Poetry Seminar in Poland, Brown teaches creative writing as an Assistant Professor of English at the University of San Diego. His poems have appeared in The Iowa Review, jubilat, New England Review, Oxford American, and several other journals and anthologies. His first book, PLEASE (New Issues), won the 2009 American Book Award. Brown appeared on the panels Gay and Lesbian Poetry in the 40th Year Since Stonewall: History, Craft, Equality and Black LGBTQ Writing as Agents of Change during Split This Rock Poetry Festival: Poems of Provocation & Witness 2010. Washington, DC—In celebration of the landmark exhibition Beat Memories: The Photographs of Allen Ginsberg on view at the National Gallery of Art through September 17, Busboys and Poets and Split This Rock present “Howl” in the City at the Fifth and K Streets location of Busboys and Poets on July 23 and 24. Renowned poet Anne Waldman and musician Kyp Malone will perform, both accompanied by a quartet of musicians led by DC-based Matthew Hemerlein. Waldman will present three performances of Allen Ginsberg’s legendary poem Howl. A string quartet comprised of Matthew Hemerlein, violin; Matvei Sigalov, violin; Janel Leppin, cello; and Karin Kilper, viola; will accompany Waldman’s reading of the poem with a musical improvisation inspired by the spontaneous nature of the Beats. A contemporary and close friend of Ginsberg and one of the few female poets associated with the Beats, Waldman will also present her original poems each night and will be preceded by local poets Chris August, Kenneth Carroll, and Venus Thrash. The performances will take place at 8:00 p.m. on July 23 and 24, with a 10:00 p.m. show on July 23. Tickets are $10 for each of the shows and may be purchased at http://brownpapertickets.com/event/118024. On Saturday, July 24, at 10:00 p.m., Kyp Malone, guitarist and singer for the popular experimental rock band TV on the Radio, will bring the event to its grand finale with a free performance on the K Street patio in front of the restaurant. Malone’s musical projects mirror the Beats’ unrelenting pursuit of creativity. The program is made possible in part by grants from the Alice Shaver Foundation and Poets & Writers, Inc. Cosponsored by The Passenger. In the first major exhibition of American poet Allen Ginsberg's photographs since his death in 1997, all facets of his work in photography are explored. Some 79 works range from the 1950s "drugstore" prints to his now celebrated portraits of Jack Kerouac and William S. Burroughs, snapshots of Ginsberg himself taken just before he achieved literary fame, and his later portraits of the Beats and other friends made in the 1980s and 1990s. The exhibition is organized by the National Gallery of Art, Washington. 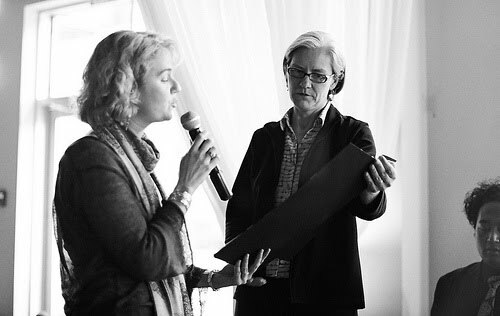 The exhibition is made possible through the generous support of the Trellis Fund. Additional support is provided by The Robert Mapplethorpe Foundation, Inc. Information and online resources relating to the exhibition are available at www.nga.gov/ginsberg. Poet Anne Waldman has been an active member of the “Outrider” experimental poetry community for over 40 years as writer, Sprechstimme performer, professor, editor, magpie scholar, infra-structure and cultural/political activist. Her published work is prodigious and she has concentrated on the long poem as a cultural intervention, with such projects as Marriage: A Sentence, Structure of The World Compared to a Bubble, and the recent Manatee/Humanity (Penguin Poets 2009), a book-length rhizomic meditation on evolution and endangered species. In 1974, Waldman co-founded with Allen Ginsberg the Jack Kerouac School of Disembodied Poetics at Naropa University in Boulder, Colorado. She was also featured, along with Ginsberg, in the experimental film Renaldo and Clara (1978) by Bob Dylan. During their long friendship and work together, Allen Ginsberg called her his “spiritual wife” and she has spiritedly continued their vision of keeping the world safe for poetry (& everything else!). In 2009 she co-edited Beats at Naropa, an anthology of conversations and essays examining the living tradition of the Beats. Waldman has been a student of Buddhism a number of years, a culturally active feminist, and an ambassador for the oral revival of poetry, appearing on stages from Berlin to Caracas, from Mumbai to Beijing. Kyp Malone is the guitarist and singer for the band TV on the Radio, an experimental rock group with ties to electro, punk, and soul music. TV on the Radio has released several albums to critical acclaim—most recently Dear Science in 2008. The band has worked with a variety of artists, including David Bowie and Nick Zinner of Yeah Yeah Yeahs, performed with Trent Reznor of Nine Inch Nails, and appeared on Saturday Night Live, the Colbert Report, and The Late Show with David Letterman. Last year, Malone released a solo album under the name Rain Machine, with similar sounds to TV on the Radio but rooted in bluegrass and jazz. He also a contributed to Iran’s Dissolver album and produced Miles Benjamin Anthony Robinson’s second album, Summer of Fear. Matthew Hemerlein is a dynamic and central figure in the DC music community. Known for his vibrantly creative Solo Looping Show, Matthew's music is an original blend of classical, pop, jazz and trip-hop that calls to mind such artists as Radiohead, Andrew Bird, Moby and Prince but ultimately falls into a category of it's own. Fluent on six instruments, including the violin, cello, seven-string guitar, mandolin, piano, and upright bass, he collaborates with both local and international acts and was the recipient of the DC Commission on Arts and Humanities Young Artists Award. Matthew has performed at such venues as, The House of Blues New Orleans, SXSW in Austin, Wolftrap and 9:30 Club, and also headlines two wildly popular monthly shows one on H Street and one at The Gibson Guitar Artist Showroom. Find out more at www.matthewhemerlein.com. 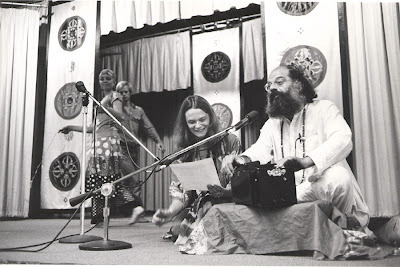 Photo of Anne Waldman and Allen Ginsberg at Naropa Institute in 1975 by Rachel Homer. leather mini-skirt, spiked wig and stilettos. with a mountain mansion overseas. trying to crush music within. From Arc & Hue (Willow Books 2009). Used by permission. Tara Betts is the author of Arc and Hue (Aquarius Press/Willow Books, 2009). She teaches at Rutgers University and leads community-based workshops. Her work has been published in Essence, Crab Orchard Review, Ninth Letter, Callaloo, Gathering Groundand many others. She is one of the poetry editors for The November 3rd Club, an online journal of political writing. Betts appeared on the Willow Books Reading panel during Split This Rock Poetry Festival: Poems of Provocation & Witness 2010. Two brides arise from the river, shivering and shining like pomegranate seeds. mother’s books and two silver trays. one candlestick and two babies. I got that pomegranate shine. Lori Desrosiers grew up on the banks of the Hudson River in NY, but now calls Westfield, Massachusetts her home. Her chapbook of poetry, Three Vanities, is published by Pudding House Press. Her poetry has been published in BigCityLit, The Equinox, Blue Fifth Review, Ballard Street Poetry Journal, November 3rd Club, Common Ground Review, Gold Wake Press’ five-poem mini-chapbook series, The Smoking Poet and others. She is the Publisher of Naugatuck River Review, a journal of narrative poetry, and also publishes Poetry News, an online newsletter of poetry-related events in the CT/Mass. region. She teaches English at Westfield State College and earned her M.F.A. in Creative Writing/Poetry from New England College in 2008. Desrosiers attended Split This Rock Poetry Festival: Poems of Provocation & Witness 2008. Open Mic at each event! In honor of Black Music Month, participants from the Lyrical City writing workshop will offer a mix of sonic textures aided by technology. In addition to live sound poems performed by the group, workshop leader Holly Bass will read "twaikus" posted by writers to Busboys' Twitter account. Calling all poets! What would you write on a tombstone to bury the Hummer? The Hummer is dead. The militaristic, gas-guzzling, polluting 8,400-pound hunks that drove environmentalists and peaceniks crazy as they cruised down our city streets will soon be extinct---the last one rolled off the production line in May. The Hummer was emblematic of a Rambo-like era, culture, lifestyle, and political philosophy disrespectful to both human beings and mother nature. CODEPINK will build a memorial to the Hummer in motor city, Detroit, before the US Social Forum begins on June 22. Our art installation will include the burial of an actual Hummer and the rise of the new economy emerging from its ashes. Picture bicycles, butterflies, a surrounding community garden, and more! We are seeking an "Ode to the Hummer" to place on the plaque that will announce the Hummer burial art piece. Read more about the death of the Hummer in this blog by Medea Benjamin. Submit your rhyme, limerick, sonnet, or prose to locals@codepinkalert.org. The author of the chosen "Ode to the Hummer" will win a special gift from CODEPINK. Ode will be selected by the artists by June 19, 2010. Can't find the words? Donate funds to help make this project a success! Passing this along. Kudos to One Common Unity for calling us together in response to this disaster that has outraged and saddened all of us. (Washington, DC) – The continuing devastation from Oil in the Gulf of Mexico has moved all of us in profound ways. We are living in times of great environmental challenges, and our voices are needed to promote more sustainable and ecologically friendly means of living. With this in mind, One Common Unity has an open call for visual artists, song writers, poets, artists, and musicians to compose new and original pieces that deal specifically with the Disaster of Oil in the Gulf. Tell us how it makes you feel, express to us what you want to do about it, and/or show us how it has changed your thinking. Through this 2nd concert in the 2010 “Common Folk: The Voices of A Movement” series, we want to help stimulate a new body of art specifically dealing with this man-made disaster. Submission for "The Disaster of Oil," opens on June 14th and closes on June 25th. That means you have 11 days to write or create your piece to directly address this international crisis. On June 27th, eight people will be selected, notified, and asked to share their piece at the main event. If selected, you will be given the opportunity to perform/ present on Wednesday, June 30th between 8:00-10:30pm in the Langston Room of Busboys and Poets (2021 14th street NW). Send your submission to onecommonunity@gmail.com. Acceptable file types are Microsoft Word, PDF, MP3, and JPEG. Please write "Submission: The Disaster of Oil" in the subject line and include your full name and telephone number in the body of the email. “The Disaster of Oil” is hosted by HawaH and features performances by Omekongo Dibinga, Anu Yadav, and 2010 Grammy nominee Christylez Bacon. For 10 years, One Common Unity has been supporting a movement for peace education and the building of a non-violent culture through music and art. For more information please visit: www.OneCommonUnity.org. This feature highlights a different photo each week from the 2 Split This Rock Festivals. For more photos from the last festival, check out Split This Rock's Flickr. A festival participant performs at the Friday Open Mic at the 2008 Split This Rock Poetry Festival. Due to the incredible exertions of the multitudes who showed up last night, we finished the mailing! So, no need to come out tonight. If you'd like to get involved and help with other things, just let us know. You'll get lots of love and appreciation. Many thanks to Wednesday evening's excellent crew! The following is an excerpt from Sarah Browning's guest post on Abdul Ali's blog, Words Matter. To read the full entry, click here. Why do I, a straight white woman, choose Langston Hughes, a queer Black man, as literary father? Because Hughes chose me, a dreamer. Let America be the dream the dreamers dreamed, he wrote in that great manifesto, “Let America Be America Again.” He chose us, those who believe America can be America again (which never was to so many). He chose the poets, the activists, the believers. From The Lingua Franca of Ninth Street (Main Street Rag 2009). Used by permission. Randall Horton, originally from Birmingham, Alabama, resides in New Haven, CT and is a former recipient of the Gwendolyn Brooks Poetry Prize. He is the author of the poetry collections The Lingua Franca of Ninth Street and The Definition of Place, both from Main Street Rag. He is an Assistant Professor of English at the University of New Haven and the poetry editor of Willow Books. Horton appeared on the panel Dissidence, Memory, and Music in African American Poetry during Split This Rock Poetry Festival: Poems of Provocation & Witness 2010. Poets & Writers is featuring a quote about the Festival from our report on their funding support on their website until June 15. Just click here: http://www.pw.org/funding and scroll down to the box on the left labeled, "What They're Saying." Melissa Tuckey and Sarah Browning at the 2008 Split This Rock Poetry Festival opening ceremonies.